What if Jeep created a truck? Oh, wait — they did! The 2020 Jeep Gladiator comes with legendary Jeep 4×4 capability and plenty of muscle power to haul whatever you need. The 2020 Jeep Gladiator is the only open air pickup truck in the industry, staying true to Jeep’s roots. 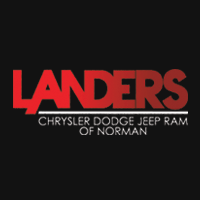 Let the all-new 2020 Gladiator be part of your adventure — coming very soon to Landers Chrysler Dodge Jeep Ram of Norman, Oklahoma! MUSCLE POWER: Let’s be real, you won’t just buy the 2020 Jeep Gladiator for the looks, even though it looks amazing! You want this vehicle because it provides the strength you need. The Jeep Gladiator now delivers best in class towing up to 7,650 lbs., making it the perfect vehicle to tow your camper, boat or ATVs. Not only does it tow whatever you need, the Jeep Gladiator also has a best-in-class payload of up to 1,600 lbs. The versatile truck bed features a three-position tailgate and a handy roll-up tonneau cover, making hauling your equipment more convenient than ever before. INTERIOR: Obviously Jeeps are built for the great outdoors, but they are also practical for everyday life. The interior has the classic Jeep bucket seats and seats up to five comfortably. The all-new 2020 Jeep Gladiator comes with the largest-in-class 8.4-inch touchscreen with Uconnect 4C NAV and Apple CarPlay. The Gladiator also has an industry-exclusive removable Bluetooth wireless speaker. Additionally, the Gladiator has innovative storage solutions so you’ll never wonder where to put your stuff. 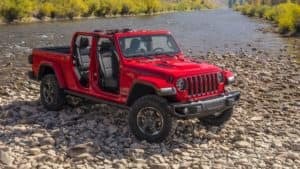 OFF ROAD: Jeep prides itself on 4×4 capability, and the 2020 Jeep Gladiator is no different! Every model is equipped with heavy-duty Dana 44 front and rear axles and a 4×4 system that offers both high and low range. The Gladiator has impressive off-road gears like lockable wide-track axles, an electronic-disconnecting front sway bar and 33-in. all-terrain tires. If you’re already a Jeep lover, you will only fall deeper in love with the 2020 Jeep Gladiator. Call to see when we will have inventory available or come visit us today!